Another Thursday is upon us! I hope you all join us for tonight’s Throwback Thursday link party! Whoop! So I’ve been thinking a lot lately about game day snacks. Or heck just any appetizer, dips, finger food in general because it just happens to be my favorite….EVA! Yup, I will sit down and eat appetizers and graze all day if I had the chance, not even sorry for that. Couldn’t care less about a full meal again as long as I got multiple little munching options. So a few weeks back when my husband and I went on our little mini vacation we stopped at this place called Aamodt’s Apple Farm. It was huge! They had soooooo much stuff. Literally I have never seen so many apple products in my life. 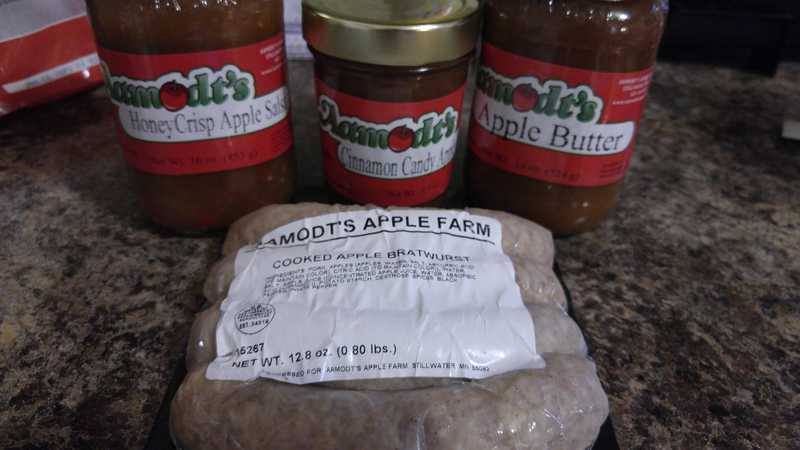 The apple brats there in that pic, AH-MAZING! But the best thing that we got hands down was the Honey Crisp Apple Salsa.What?!?! Apple Salsa you say, oh yes I do. Best salsa I have ever had! And in my recreating fashion I had to try to attempt making this stuff myself. A quick browse of the ingredients list on the jar and I had a pretty good idea on what I needed to make this bad boy. 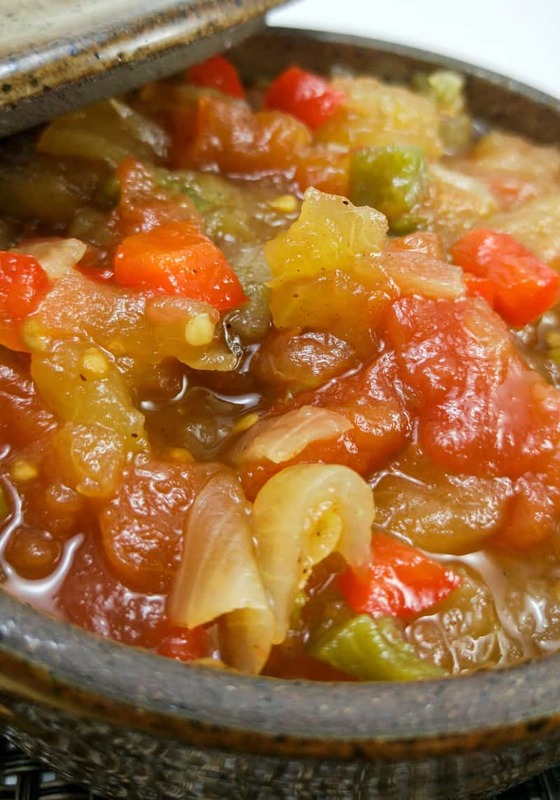 If you’re not a fan of sweet salsa, this my friend may just make you turn into one. It has the sweet kick from the apples and cinnamon then the spicy punch from the jalapeno. A true flavor match made in heaven. This stuff is great as a dip, but it’s also awesome as a topping. I’ve eaten this on brats and chicken and it pairs well nicely with each. So if you’re looking for something to do with all those apples that you haven’t gotten to use up just yet, whip yourself up a batch of this, you’ll than me later! 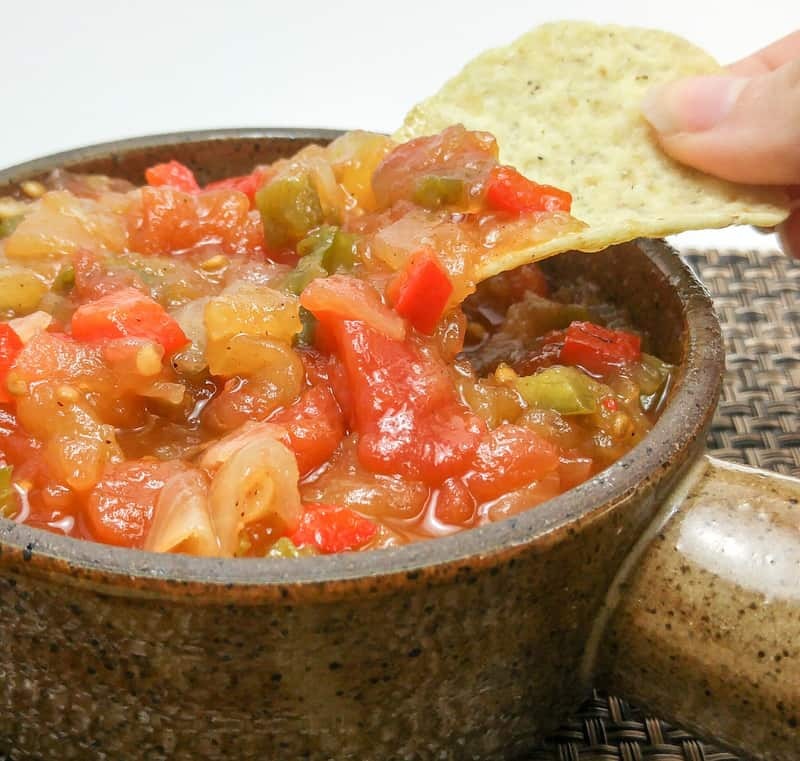 A spicy sweet salsa with apples, peppers, onions and tomatoes all combined with spices to make this one great salsa! Add all ingredients to large pot and bring to boil. Cook stirring often for 2 hours or until thick. Once thickened, remove from stove and using a pastry cutter or potato masher, mash the salsa down until the apples get broken apart and a little mushy. Distribute evenly among 12 1/2 pint canning jars. Stir in about an 1/8 tsp citric acid into each jar and give a little stir. Clean off rim and place lid on. Transfer to a water bath and boil for 10-15 minutes. Do this in multiple batches if needed. Remove from bath and set aside to cool. Salsa will last about 1 year unopened and about 1 month opened and refrigerated. **You need not add the citric acid, we add it as a preservative measure for the tomatoes. To see where I’m linked at visit my Link Parties page and join the fun! Don’t forget to link up with us every Tuesday and Thursday nights at 6pm CST for Wonderful Wednesday’s and Throwback Thursday’s! I hope you get a chance to make this Kathryn. I seriously don’t want any other salsa….like ever again. What a fun mix of ingredients. 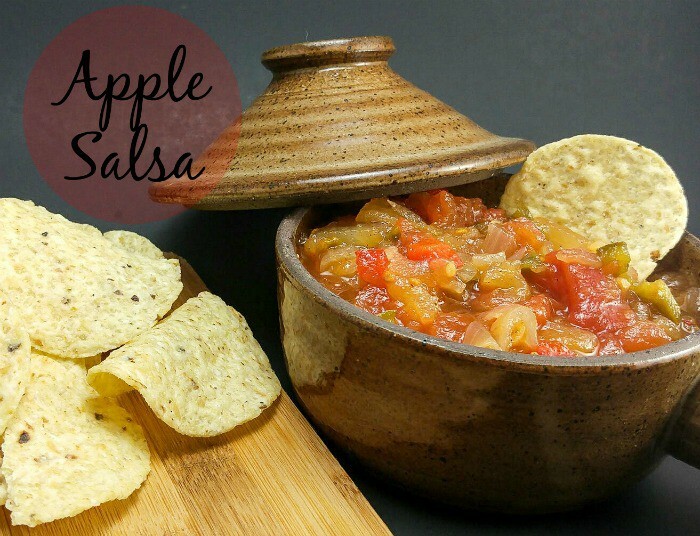 I have never had apple salsa, but I would love to give it a try! Oh Carlee I’m not turning back. Apple Salsa is now my go to. Great for more than just chips. I absolutely LOVE apple with a hit of spice, and the contrast of a bit of sour, sweet and hot sounds delicious here, it’s like a Mexican chutney, yum. Mmm Mexican Chutney sounds great! Thanks for stopping by! I think it pairs perfectly yum I love it. Thanks for stopping by! Thanks! It was awesome on brats. You got me stumped on goetta my friend. I have never put apples in salsa before, but I am now. This looks so good. It’s a great flavor Beverly!